At Euro Crime during October, three of my reviews appeared. One of them is of a non-fiction book, Andrea Camilleri: the Companion to the Mystery Fiction, by Lucia Rinaldi, which will fulfil anyone’s curiosity about the Montalbano oeuvre in book and screen form. The other two reviews are of novels: Too Close for Comfort by Niamh O’Connor and Babylon by Camilla Ceder, translated (from the Swedish) by Marlaine Delargy. I read one non-crime novel, The Casual Vacancy by J K Rowling, a depressing and bleak account of modern social hypocrisy and the misery of families (some of them with the veneer of social respectability, some not). Of the crime novels I read, two are Swedish, one Finnish, one Norwegian, one Irish, one Scottish and one from the USA. 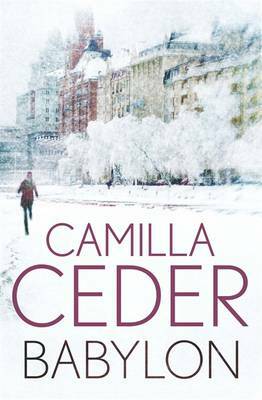 My favourite of the crime novels in this collection is an easy one, Babylon by Camilla Ceder. For other bloggers’ choices of books of the month for October, see Mysteries in Paradise. This entry was posted in Reading report by Maxine. Bookmark the permalink. Interesting Maxine. I’ve just finished Babylon and I didn’t like it as much as ‘Frozen Moment.’ I don’t fancy ‘The Casual Vacancy’ at all but am interested to hear what you thought of it. The Camilleri companion sounds interesting. I think Babylon did well in comparison with the other crime novels I read this month, Sarah. The Casual Vacancy is readable, but the author has not quite made the transition from child to adult author (too much exposition, etc). It is so depressing, though. Maxine – You’ve really read an interesting mix of books. And I’ve heard a lot of good things about Babylon, so I would like to read that one. Like Sarah I’ve not yet read The Casual Vacancy, but I hope you’ll post a review of it. So, what did you think of the Denise Mina book, Gods and Beasts and Attica Locke’s The Cutting Season? Mina’s is readable but a hotch-potchy mess! Locke is rather like her first- a bit heavy-handed but very sincere and on an important topic. The story itself is much better than the crime plot which is silly. I recommend reading it, even so. I thought Babylon was quite good, but not really spectacular. However, I made the mistake of reading it in English after reading the first book in the series in German, and that’s never a good idea – I had a particular tone in my head, and the English didn’t quite match it. (Not a translation problem, it’s simply that I don’t read the languages in the same way.) But I’d still pick up the next book in the series. Plus I also wonder if the book is too dated – 1994 is actually a long time ago. I hadn’t thought of the Lisa Cody or McDermid comparisons, but you’re right. And actually, Anna Lee and Kate Brannigan I remember reading in the mid-90s thanks to a very good local library. (More recent McDermids are a bit too gory for me.) That does raise a wider issue, though, and one for which I really don’t know the answer – how should translations of older books be received? (Particularly ones like this that are old enough to be dated but not old enough to be really historical.) I mean, it’s not necessarily an author’s fault – speaking generally, not just about this book – if tastes, experiences/genre exposure and editing fashions have changed. I just ordered Babylon a few days ago so look forward to reading it now. I didn’t adore the first book but thought there was a lot to like and now that I feel like reading again it seemed like a good time to order a few new treats (also arriving soon will be the new Indridasson). I am glad to hear you say what you said about the Rowling – i read the first couple of chapters of someone else’s copy in advance of me possibly getting my own copy but it really didn’t grab me and I suspect you’ve hit the nail on the head. I struggled to think it would have been picked up if it were by Ann Smith. Am currently listening to a book you recommended several times – Allegra Goodman’s Intuition – really enjoying the insight into the science/research world – I used see all the grant applications from various groups applying to us for research money and never knew it got so intense on the other side of the fence. Fascinating stuff. I will read the Locke and read the Mina if the library has it. I won’t buy it, given your opinion. Thanks for the kind words, Kathy. I hope to return to more frequent blogging at some point. That would be lovely, Maxine. Meanwhile, it’s to FF and Eurocrime. I read the review of The Summer of Dead Toys and it went on my TBR list.